I love clay! I’ve been getting my hands muddy since I was fourteen years old in a Saturday clay class at the Corcoran School for the Arts in Washington, DC. Since then, I’ve taken and taught several clay classes and workshops to further my skills and share my knowledge. What began as a hobby, morphed into a creative outlet and evolved into a business. It is a passion that calls me back to the studio on a daily basis. My husband and I raised our two children in the suburbs of Washington, DC. We have shared our lives with four golden retrievers over the years (sometimes two at a time!). We have also lived in Charlotte, NC, Hilton Head, SC and now Frederick, Md. Each locale has influenced and broadened my clay experience. Clay offers so many avenues to explore artistically; I find the possibilities endless. I am always learning and growing in my expression. Most recently I create hand-built shapes with lots of applied texture and brightly colored glazes. In addition to clay, fiber and other crafts keep my hands busy when I'm not in the clay studio. I've always got a project going so when I'm sitting in front of the TV or sometimes at a sporting event, I'm still creating. I practice yoga and wish I’d started much earlier in life. I love to cook and use the Internet as a resource for ideas to try out! When I find a recipe I like, I want it. That's why I often include one of my recipe cards with the serving pieces I sell. I like to make items that are functional as well as fun to look at – hence the term ‘FUNctional’. Ideas and inspiration for my art come from friends, customers and teachers. All of my pieces are connected to the original story of that idea and the evolution of their creation. My pots are decorated with surface textures, harmonious food-safe glazes and complimentary accents. Each one-of-a-kind form is shaped and completed by me. Hand-building methods are used to produce each final piece. I now joke that my wheel is 'the treadmill' of the studio -- not getting much action these days. Because I do not mass-produce pottery, the creation of each piece takes time to complete. I often personalize a shape or color choice to make it unique to you or your group. I make many of the texture tools I use to embellish the clay surface. I've found that the bottoms of shoes have some really interesting designs and often ask customers to let me take a look at the ones they are wearing! Sometimes I enhance my clay work with a mixed media approach incorporating found and collected trinkets, driftwood, leather, copper, glass beads, buttons and even yarn. "How Long Did it Take to Make This?" I get this question all the time. It’s both hard and easy to answer. I have spent years honing my craft and cultivating my creativity, days thinking about how to develop a particular piece and hours to make it come to life. I hope you enjoy the fruits of my labor as much as I loved making it! I currently use low-fire clays to achieve the bright color palette you see in my work. Pieces are food-safe unless otherwise noted. 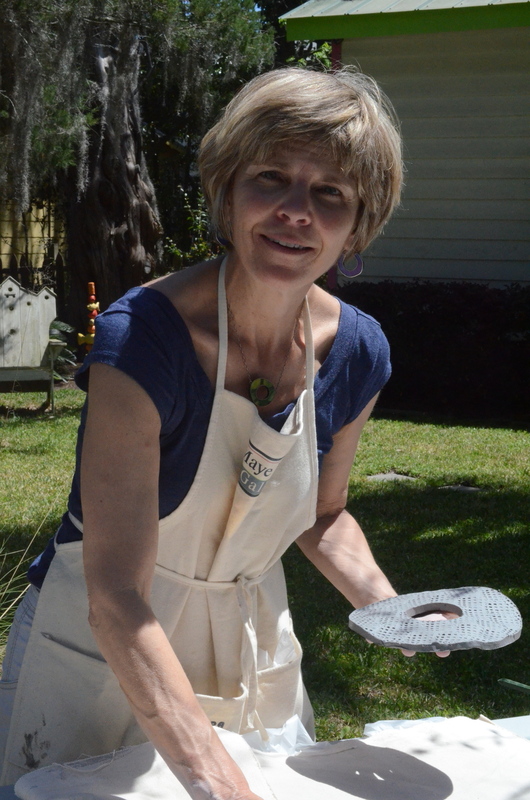 You may bake, serve and use the dishwasher to clean the pottery I make. I do not recommend using the microwave for these pieces. Get news, promotions and updates from ClayByLaura.